What a beautiful color you are. A great companion to people and the other mice. Hi Taoko! Happy Pet of the Day! Be still my heart! 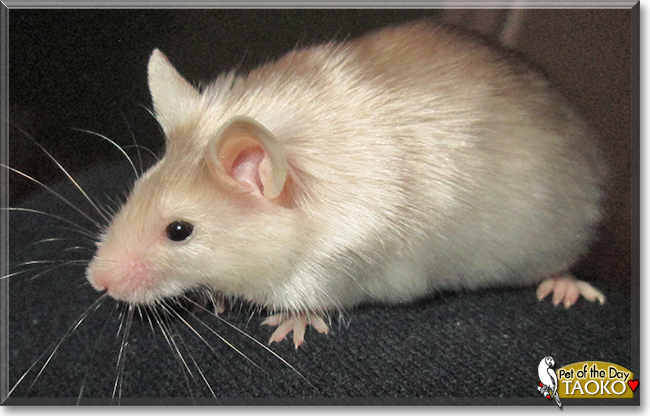 What a beautiful, most precious Fancy Satin Mouse you are, Taoko! Your champagne coloring, your shimmery, satiny coat are gorgeous, and that sweet little face of yours is a total heart-melter! How lucky your human is, having a furkid as beautiful, as laid back and loving, as sweet and gentle as you! The joy you bring to your human's days is truly a priceless gift! And as if you couldn't be any more special, you saved your depressed fur brother's life with your gentle and comforting ways! What a treasure you are, Taoko, just as special as they come, and so very deserving of your big day of honor! Thanks for the BIG smiles, sweet little one! Meeting you today, seeing your heart-melting photos, has been a joy! I hope your enjoying a very special Pet of the Day celebration...playing with your mouse friends and spinning leisurely on your wheel; munching on peanuts and napping in your soft, fluffy bed; cuddling with your human, being loved and pampered to pieces! Lots of love, gentle snuggles and wee kisses to you, precious Taoko, our very special and most deserving Pet of the Day, EVERY day! Love to all of your mouse pals, too! Taoko is a very beautiful, darling wee mouse. I do believe rosette satin is a perfectly accurate description of her pretty coat and that she is a very unique and incomparable mouse! What a perfect POTD! Dearest Taoko, you are adorable! What a beautiful, precious Fancy Satin Mouse you are, and what a wonderful personality you have, too! You are very sweet and affectionate, and you even saved the life of your dear skin-brother by simply being a good companion to him. You and all your family members love each other very much, don't you. What a wonderful love-filled home you share! 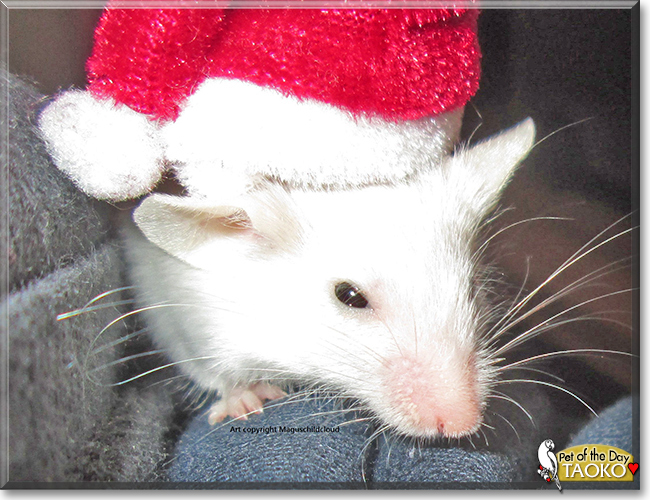 Congratulations, darling Taoko, on being chosen today's Pet of the Day! We hope you and all your family and friends are enjoying a fine celebration, full of fun and lovies and all your favorite games and treats, maybe a special serving of peanuts! Congratulations on being Pet of the Day, Terrific Taoko!